anyone know how to use module "Get Next Random INT" from ecobrowser ? Re: How to use "Get Next Random INT"
On the 'int pool count' you can set a number and it will get numbers between 1 and the number that you have set. On the 'int serie count' you can set how many times it needs to get a number. On 'store next int' you need to set a variable to get the selected int. 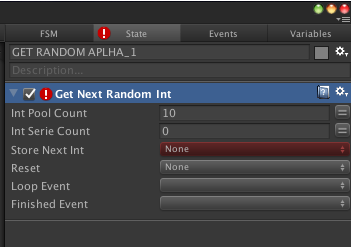 On Reset you can set a bool variable and you can set that variable to true if you want to reset the action. On 'loop event' you need to set a transition to a state (or group of states) that will lead back to the state where 'get random int' is.